Professor Carlo Rubbia receives the degree at the graduation ceremony of the School of Mathematics, Computer Science and Engineering. 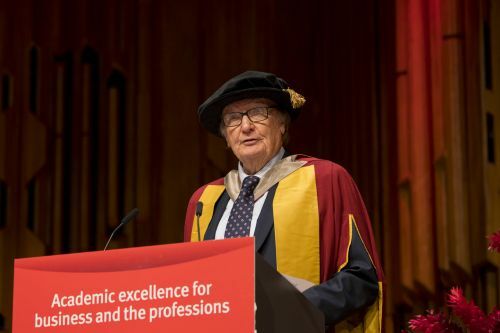 Professor Carlo Rubbia has been awarded an honorary doctorate by City, University of London in recognition of his outstanding contribution to science. The presentation was made during the graduation ceremony of the School of Mathematics, Computer Science & Engineering on Wednesday 18th July. In 1984, Professor Rubbia shared the Nobel Prize in Physics with Simon van der Meer "for their decisive contributions to the large project, which led to the discovery of the field particles W and Z, communicators of weak interaction”. The work provides strong evidence that theoretical physicists are on the right track in their efforts to describe Nature at its most elemental level through the so-called "Standard Model". After receiving his award, Professor Rubbia urged graduands to follow their curiosity and keep searching for those amazing discoveries which will transform the world around us. Professor Rubbia has been a Senior Physicist at the European Laboratory for Particle Physics (CERN) since 1961. A Higgins Professor of Physics at Harvard University for 18 years, he was the Director-General of CERN from 1989 to 1993. Since 2013, he has held a professorship at the Gran Sasso Science Institute at L’Aquila in Italy. Born in Gorizia, Italy, on 31st March 1934, Professor Carlo Rubbia graduated with a degree in physics from Scuola Normale, Pisa in 1957. He completed his studies at Columbia University. His current research activities include finding solutions to the problem of energy supply for the future, with particular focus on the development of new technologies. Professor Rubbia has received many prestigious awards and honorary degrees from over 35 universities around the world. In 2013 he was appointed Senator for Life by the President of the Italian Republic in recognition of his outstanding scientific achievements. He is no stranger to City, having successfully delivered the 43rd Edwards Lecture in May 2017 on The Role of Elementary Particle Accelerators. The Lecture attracted a wide audience from across the UK, including senior figures from industry, business and cultural sectors in London. Professor Rubbia told MCSE graduands that his team at the Institute for Advanced Sustainability Studies in Potsdam and the Karlsruhe Institute of Technology had recently succeeded in proving that the very large resources of clean, abundant and cheap natural gas from fossils may be freely used without increasing greenhouse gas emissions, representing a flawless resource for many centuries to come.